Brown river, wider than a mile. It rained in the night it was still raining when we left town. It rained all morning. The Norwegians had to get it right eventually. 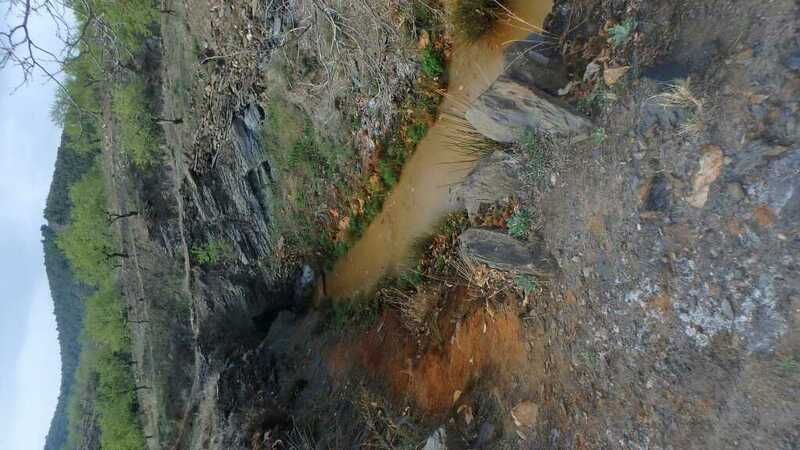 Brown rivers flow down our paths and yesterdays dust is todays mud. 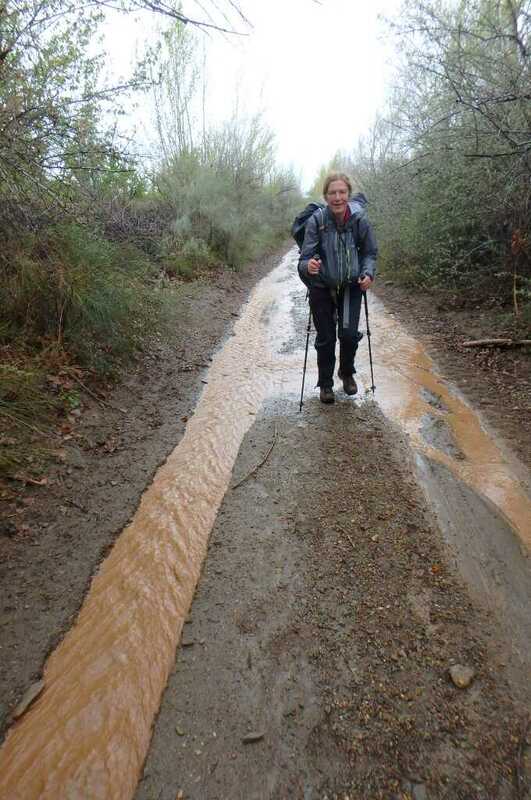 Several of us are glad we are using walking poles as the sloping mud resembles a discloured ski slope. The day however is not without its pleasures. Tony spots a tiny frog or toad out for a stroll, Tim claims a dark red wet squirrel and a tree creeper. Betsy much latter, when the sun is shining and we are bowling along up a valley of gorse and, olive and almond trees is distracted by yet another flight of bee eaters. We arrive in Los Banos it is still raining we feel we do not need a bath the showers have been more than adequate. At 12 we are too early for the Menu del Diario so have various bits including a goat and garlic stew bits of chicken and some asparagus in scrambled egg. We are just about to set off when the continuing shower becomes a down pour. Coffee is in order . Two probably German cyclists enter. They are wet and on their way from Malaga to Barcelona and will try to stay the night here. 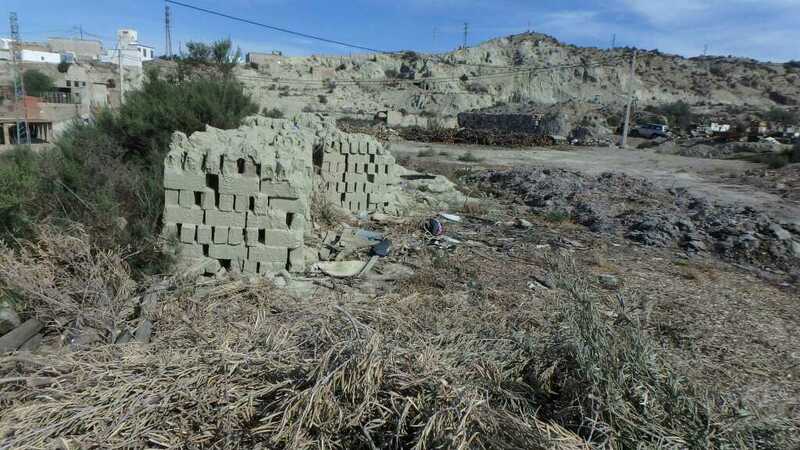 This and the other towns we pass through all have their troglodyte houses carved out of the claylike rock of the area. Earlier we have taken shelter in an unoccupied hobbit hole when the rain got heavy. The rain stops we start walking and layers are gradually removed. 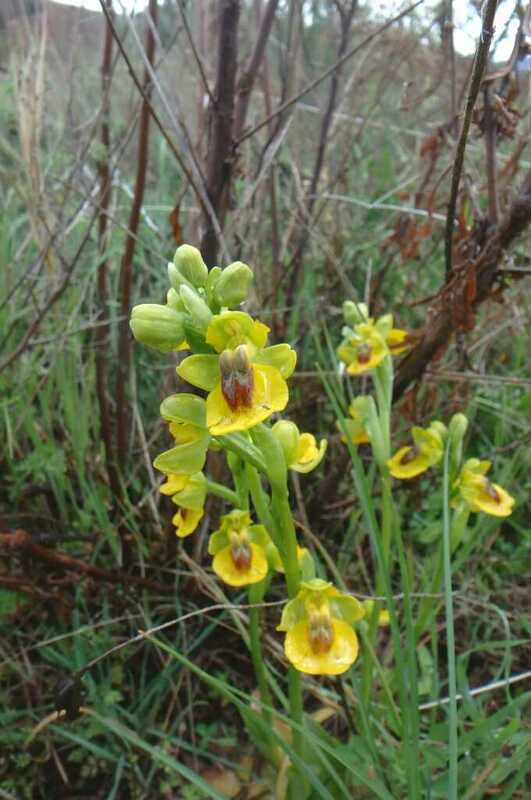 Ray spots a couple of clumps of yellow orchids no one has seen before and the whole countryside seems fresh. None too soon we crest the hill and turn right our destination appears a couple of hundred feet below us, a path winds down we start down and in a few yards our feet have doubled in weight the ends of our walking poles are cricket balls of mud . This of a particularly glutinous consistency and provides no little problem in descent. However we shed the worst on reaching the metalled road in town and meet Maria a local lady who takes us to the school, thankyou Maria, and hands us over to the teacher. Who shows us bunks and showers donativo above the school. A stroll across the Shire. 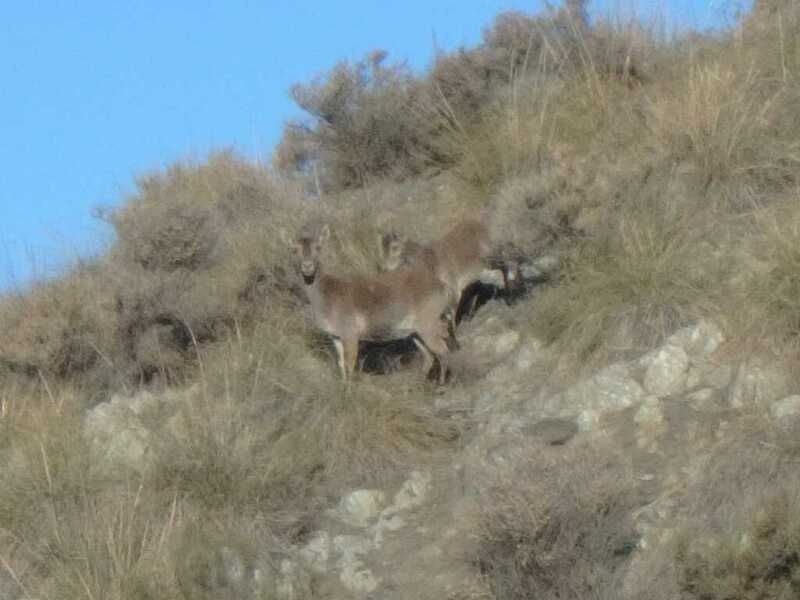 Alquife to Guadix 13.5 miles 6 hours 300m up 600m dowm. Manollo's Alburgue Latcho is a great place to stay very quiet till the cockerel woke about 6.30 even then he was restrained.We were taken by Manollo for a few drinks and tapas back to where we had lunch and most slept well. 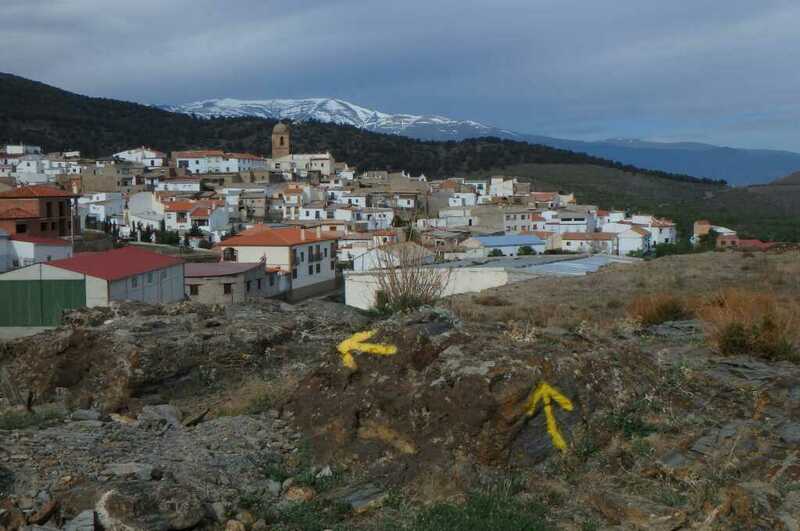 After breakfast we roll down hill and continue along the camino following the yellow arrows. 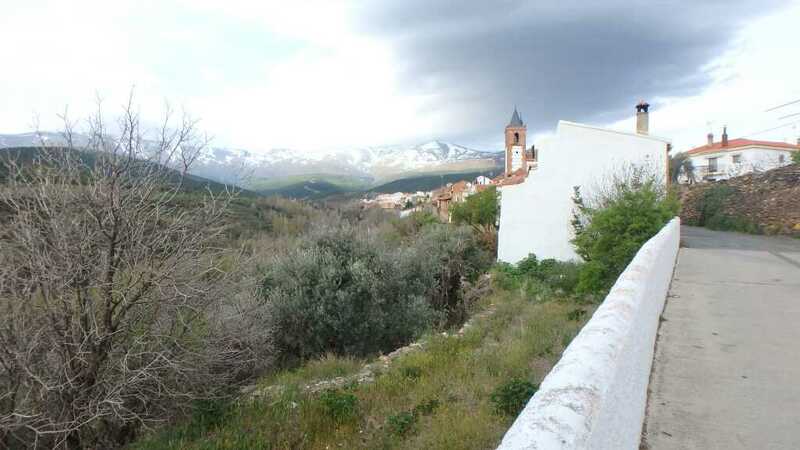 The snows on the Sierra are a continuous presence and we climb towards them for the first 5 miles the last stretch up to Jerez del Marquesado on the side of a valley with snows ahead evoking thoughts of Fairports Meet on the Ledge. So far it has been a grand walk with varied intetestafter coffees we track around the edge of the Sierra and descend to the plain where a cold wind is blowing this and one or two drops is all we see of the rain promised by the Norwegian weather service. After another stop in a bar in Cogollos de Guadix under its big church tower and yet another set of Moorish baths we are off across the dry plain and dusty tracks to Guadix. We are glad to drop into a huge dry river valley out of the wind and see another troop of bee eaters. 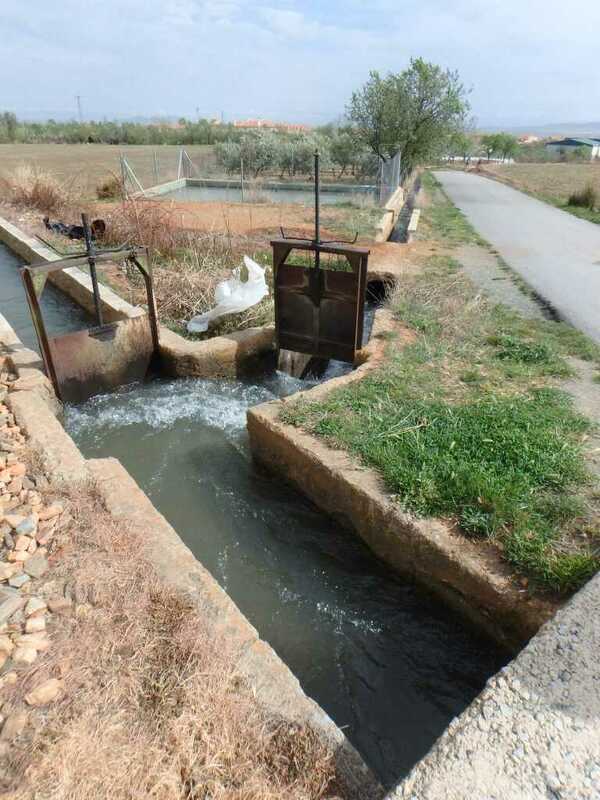 Water is carefully managed round here and sluices and ditches are still in service to irrigate crops. 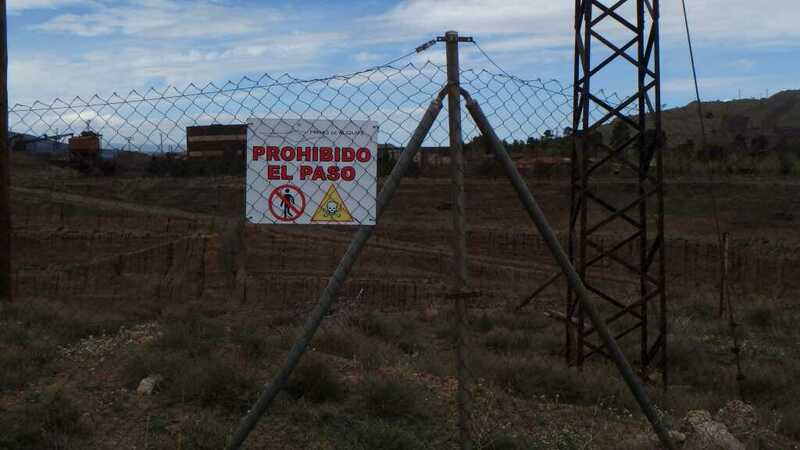 Eventally non too soon we arrive in Guadix. This is Hobbittonhlf the buoldings are half underground and chimneys pop up out of the ground. After a Menu de Dia with some good Bino do casa we get in touch with Mariangeles who runs the alburgue and get directions to it. 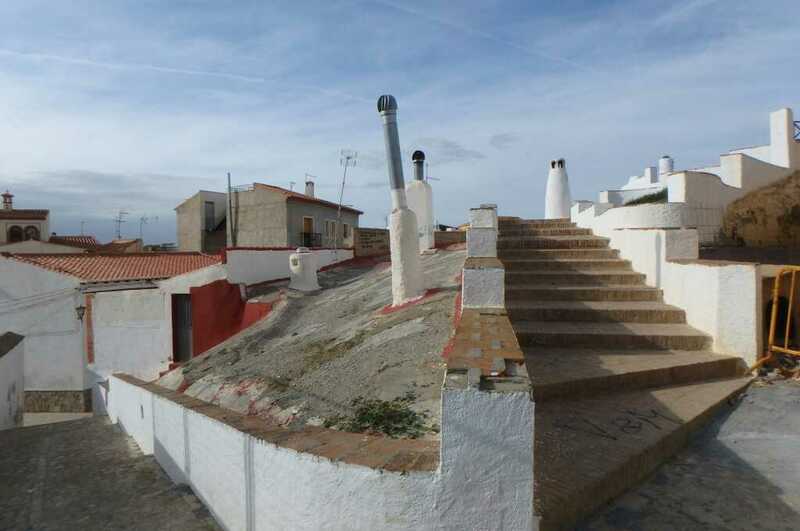 We are welcomed in and shown round an old Roman,Moorish house on 3 floors. The lower floor is a museum around a typical Moorish courtyard the first floor is where she lives and the to is the stupendous albergue. Well up there with the best and most interesting we have stayed in on any camino.We have wander round town . 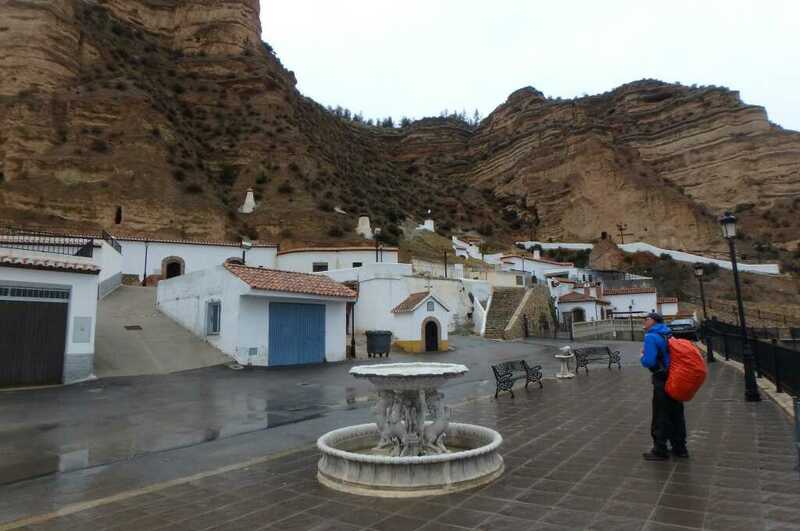 It is a modern Spanish city and an extensive troglodyte warren at the same time. Quite an amazing place, there are potters and a brickworks probably established by digging out the warrens. Hueneja to Aquife 13miles 8hours (including lunch) and about 500m up and down. Progress so far has been up the river valley of the Andarax and its tributaries the Nascimiento and the Izafalada. We have gained about 1100 m in altitude , although undulated up and down a lot more. 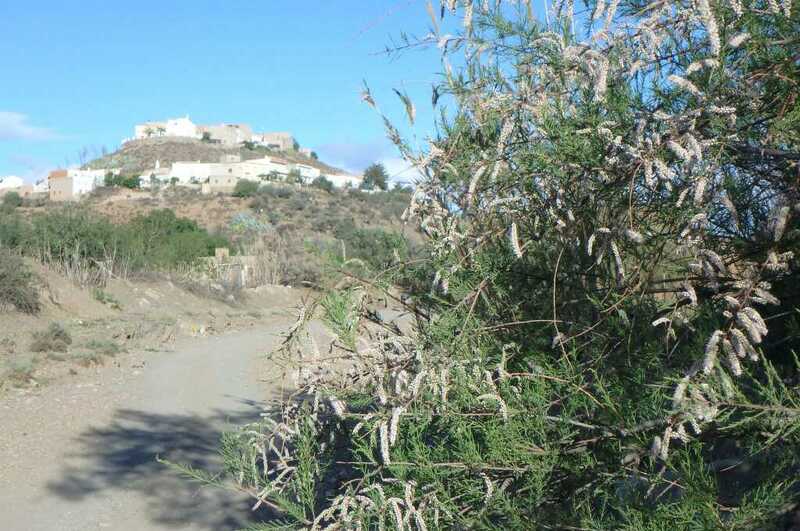 This we have learned is the old Royal road with staging posts that connected Almeria on the coast with Granada and the caliphates further inland. Also the route up which the Catholic Kings forces travelled during the final reconquista of Moorish Southern Spain. 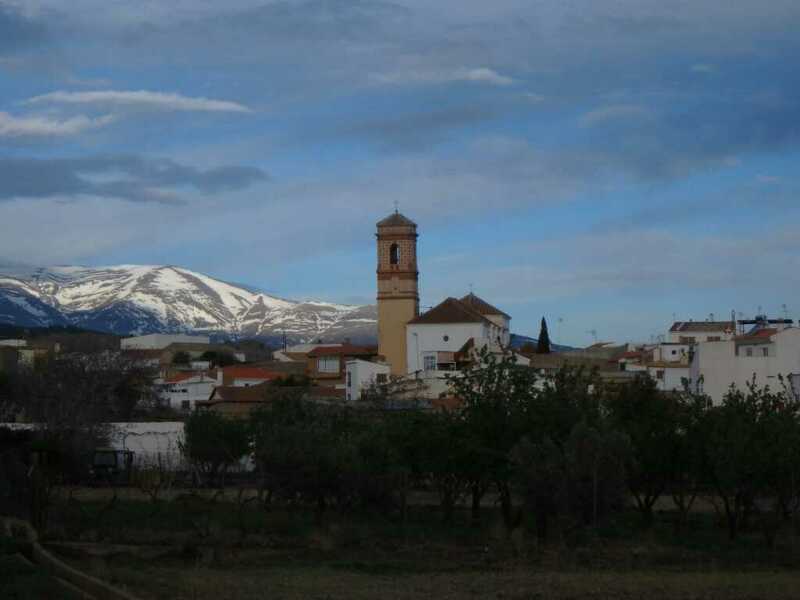 The town we have stayed in last night, in the first alburgue donativo of the trip, is Hueneja, at 1100m it is situated at the end of the valley that has led us around to the north of the massif of the Sierra Nevada and to within five days march of Granada. Reviewing yesterdays photos Betsy has seen and recorded a Woodchat Shrike a blackbird sized predatory bird of the orchards and scrub we have passed through. Today we pass over the watershed of the Andrax tributaries round the north of the Sierra and into flatter but high (3000ft +) country. 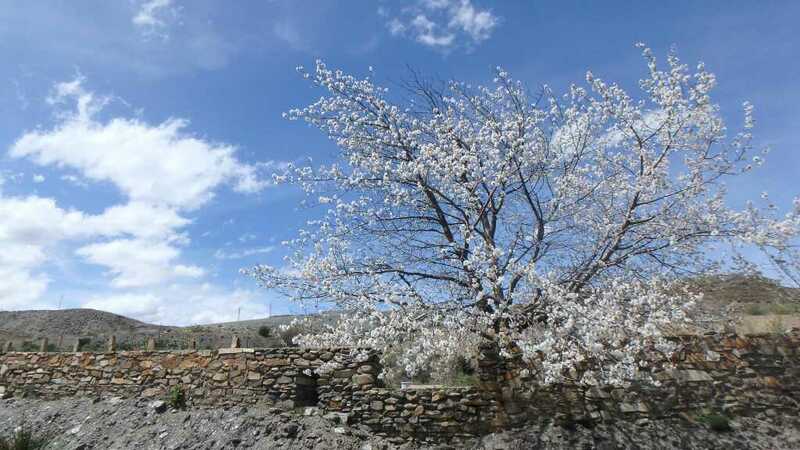 This is covered with almond groves and mostly within sight of the eternal snows of the Sierra. 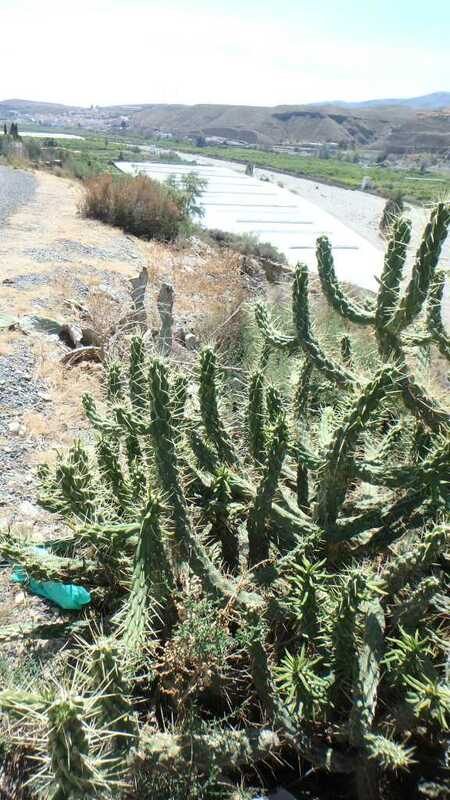 Even round here where it is definitely a bit less arid the locals are complaining about the lack of rain or snow. We walk on past several holes in the ground some small some bigger and some , after 800years of mining iron ore very large indeed with large pools of water at least on the map in the bottom.These have left some serious fenced off scars on the landscape. The rain promised by the Norwegian weather service never quite arrives though it is cloudy all day and quite cold in the wind off the eternal snows. 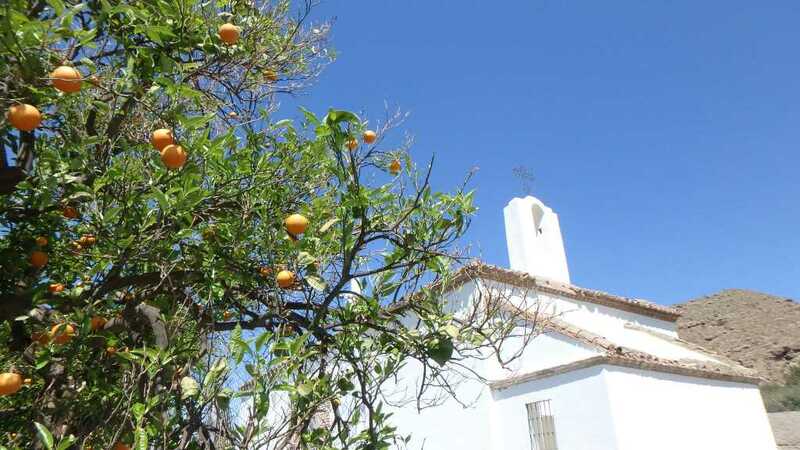 There are small towns each with a bar and alcazar or citadel and a claimed set of moorish baths, often used for different purposes and sometimes only recognisable by the filled porticos and the tourist office sign. At length after a good lunch of bean stew, we need a warm wind from somewhere, we reach our resting place in Alquife. 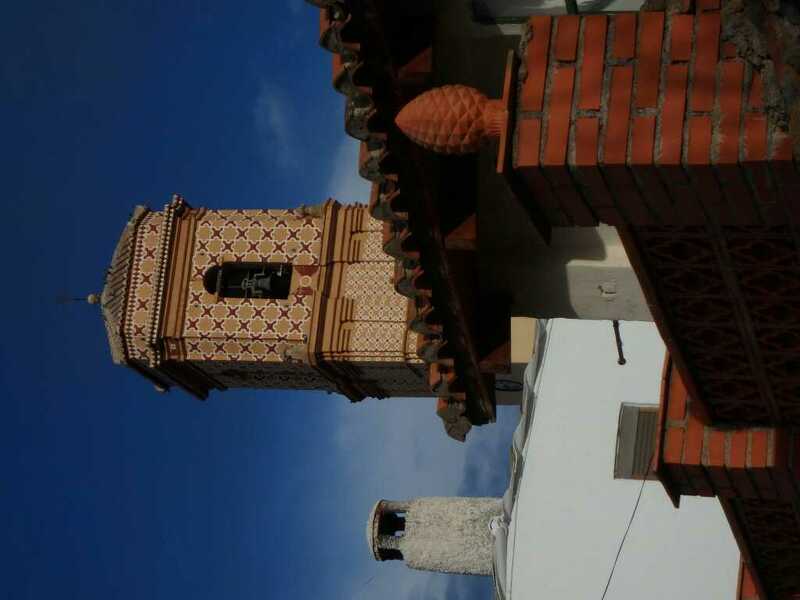 We start to cast about for the lodging in the guide, the top floor of a house as an alburgue. Betsy asks a couple in the street " Ahh you want Manollo" Pulls out phone he will be here in 2 minutes!! Sure enough a battered Ford pulls up we are introduced and pile in. A short drive up the hill and our host shows us a great suite of rooms above his house. He will take us into town for beer and food tonight. Abla to Huenja 6hours 13 miles maybe 400m of ascent. We have a lesser day planned thank goodness but it is Domingo. No shops open but we have had email communication with a hospitalero in Huenja assuring us the alburgue is open and expecting us. We get a standard breakfast tostados, coffee and orange juice, the juice as you might expect round here freshly squeezed, downstairs in the bar. 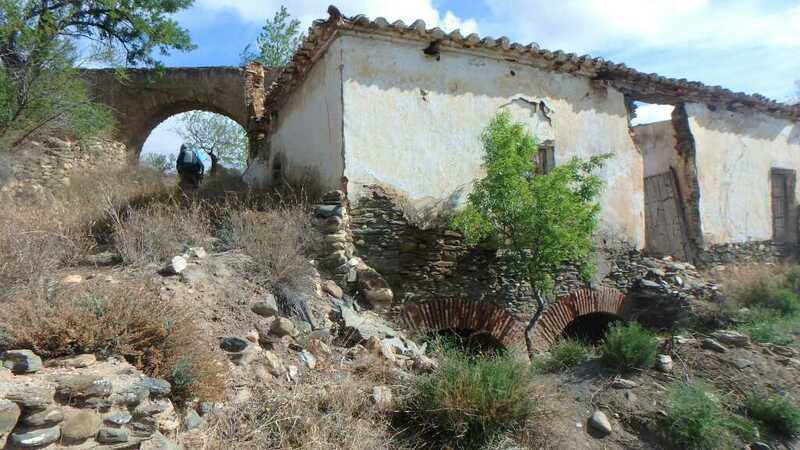 The hostal we were told was closed is during the week inhabited by the men who look after the big electric fans on the hillsides but often closes Saturday as they have gone home. Making our way down to the river bed we follow the Rio Nacimiento up to Finana passing several little places beginning with Venta which signifies a way station /stables on the main road from Almeria to Granada and onward. The best of these is Venta Ratonera after the man who made his name selling mousetraps. In Finana we find as promised by the tourist man who showed us the Roman Mausoleum yesterday, an Alcazar and baths from the Moorish period. Although he gave us the numbers of people who would be happy to show us round we feel we must press on , after coffee. The countryside definitely is less of a desert, it has probably rained since October but not much. There are fewer dieing trees and more flowers. 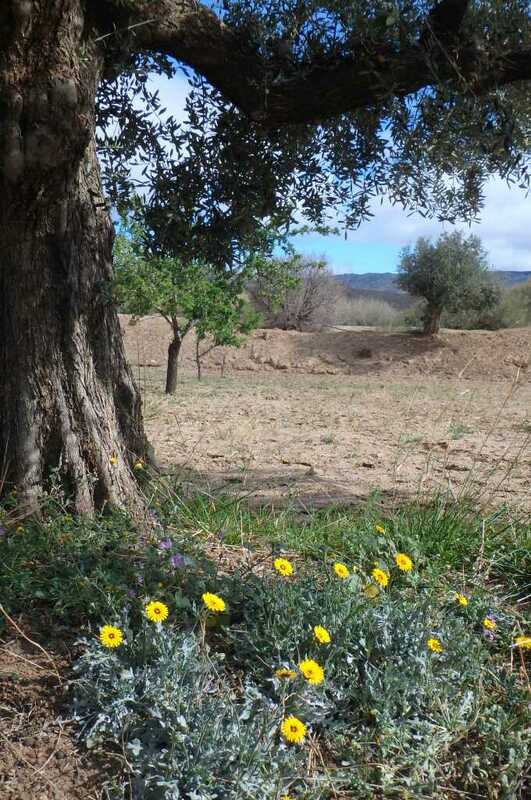 There are more olive groves and almonds are replacing oranges. Ray spots on the road the first snake dead alas and only fit for Betsy's cauldron. While this is being inspected Tim spots several redish backed birds perching amd flying between trees. He wonders if they are shrikes but an imperfect picture at maximum zoom from Betsy's camers shows them to be bee eaters. A derelict Molino (watermill) distracts Ray and Tim who see its mill race and small aqueduct are now diverted to water the surrounding area. 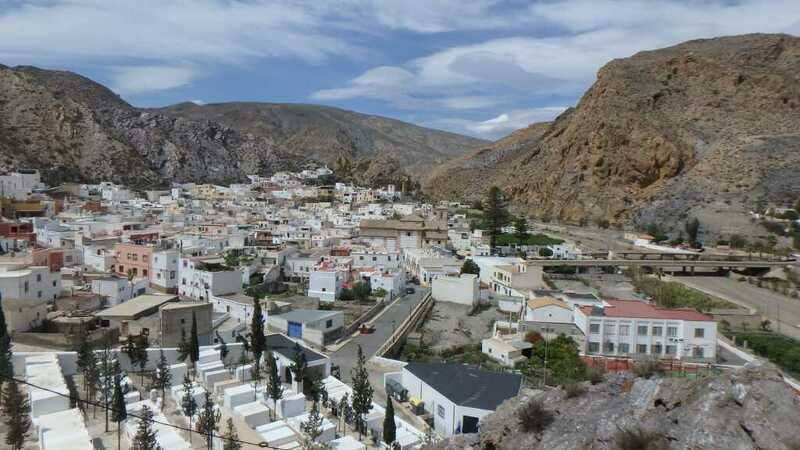 Gradually after an appropriate bar stop we reach Hueneja a town a bit further up the valley. Where an Albergue awaits. A bar and some food is first priority and then we find the old folks home of the Whitehead Cross where the key to the albergue is kept. We buzz the door and are admitted, noticing as the door shuts behind us there is no doorknob on the inside. We are passed by residents into a comunal space where staff find us the key and release us with directions to the albergue. These are comprehensive and accurate and we rapidly settle in and half of us feel better after the two hot showers the tank allows. Ray and Tim get very lukewarm ones. The temperature has dropped rain is forecast we are sure the locals hope so but are not holding their breaths . Rain round here is in short supply. A river bed too far. Aboloduy to Alba 9hours 18.5miles and 1200metres of ascent We are tired! We need an early start so up at 5.45 breakfast and walking just before the light up the river bed of the Nacimiento a dry tributary of the Andarax. We are warned by the Pilgrim information lady and the guide booksnot to keep to the river bed but climb up as indicated by the arrows. We do it is steep but by now full light. after a while we look down to see green growth and inpenetrable thickets and rock with occasional views of water deep in a gorge. 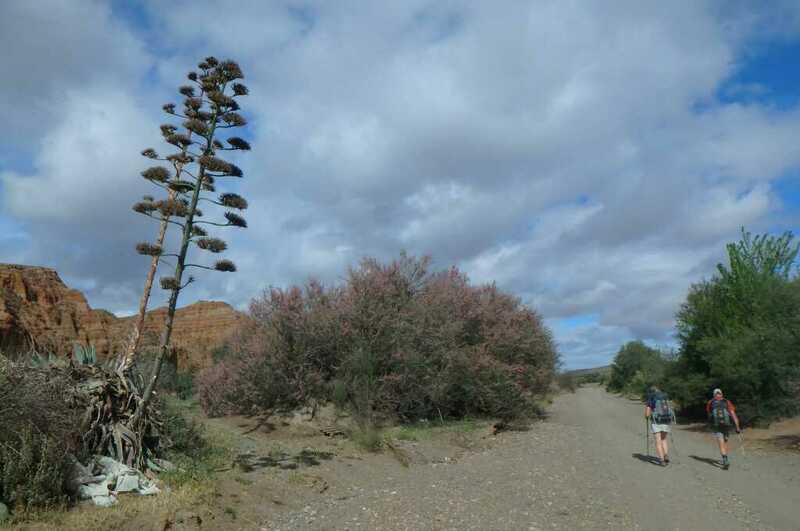 After passing quite a few deer and some olive groves and an almost equally steep descent we walk down the river bed through walls of dry bamboo and some very old tamarisk we reach the town of Nacimiento, which gives the other its name we are unsure about. But the coffee is welcome. We have covered about a third pf the days distance. 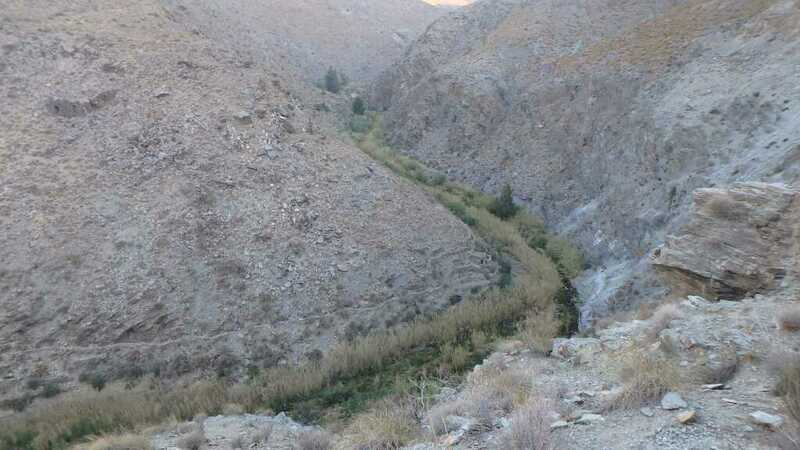 We now continue up the dry river to Alba spotting a Zebra Swallowtail butterfly and quite a few flowers there is marginally more water about but the whole region is suffering from drought and unwatered old olive trees appear to be dying in some places. Eventually after two more very necessary beer stops we weave our way into Alba a fair sized town for the area with three potential lodgings. We try for the farest away as recommended but are told by locals outside a bar that it is closed on Saturday so reverse to next on list who are full but phone up Mira Sierra Hostal the one supposedly closed who open up for us. Just another day on Camino. 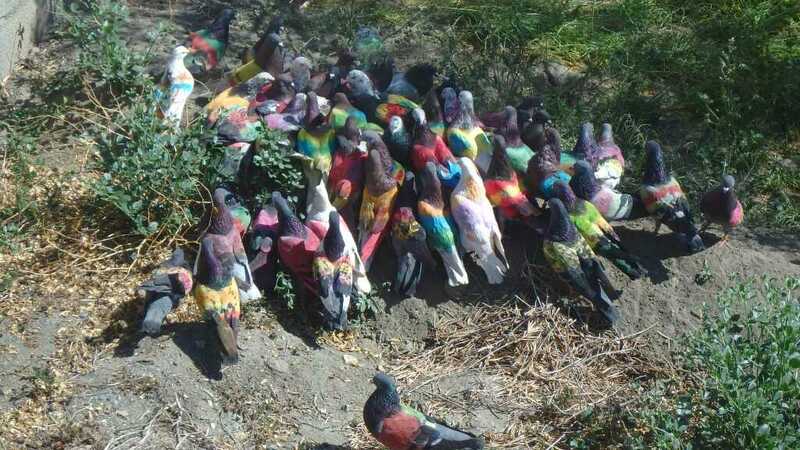 Of painted pigeons and Adobe. Not Photoshop. Up early and along to the village for a quick tostados and cafe before heading out into the parched landscape up a steep hill. We learnt last night it has not rained here since October. Even some of the tough scrub vegetation and Stone pines are dying off. We do manage to spot a pair of Greater Spotted Cuckoos and a pair, probably of bee eaters. Who we hope are not heading for the same alburgue as us tonight and after coffee head down to the bed of the river which has a metalled road running up the side of it. This is a better irrigated area than yesterday and we wander up through orange orchards. When suddenly we see a new brightly coloured bird. It settles just too far away for a good look we creep vloser trying to get a good picture of it. After a few minutes we get a good look and fail to identify it. We see two more strangely coloured birds and the a local with a flock of 20 or so pigeons all of whom he has psinted brightly at the age of one year. Each to their own. Further up the river we finally reach Alboloduy. A very well situated village with a bar. We are directed to the Ayuntamiento where a lady woth a host of information about the town finally takes us to the alburgue/casa rurale. 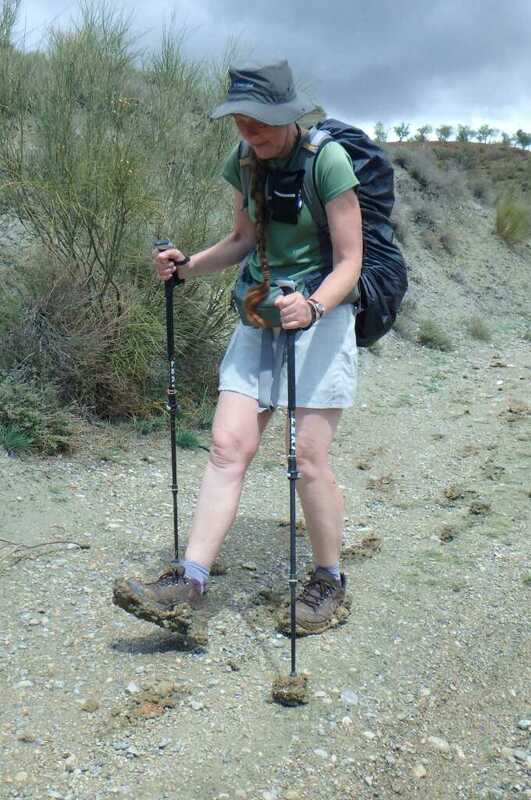 Almeria to Santa Fe de Mondujar 14.5 miles an maybe 400 m ascent. Today was a bit of a spagetti western. 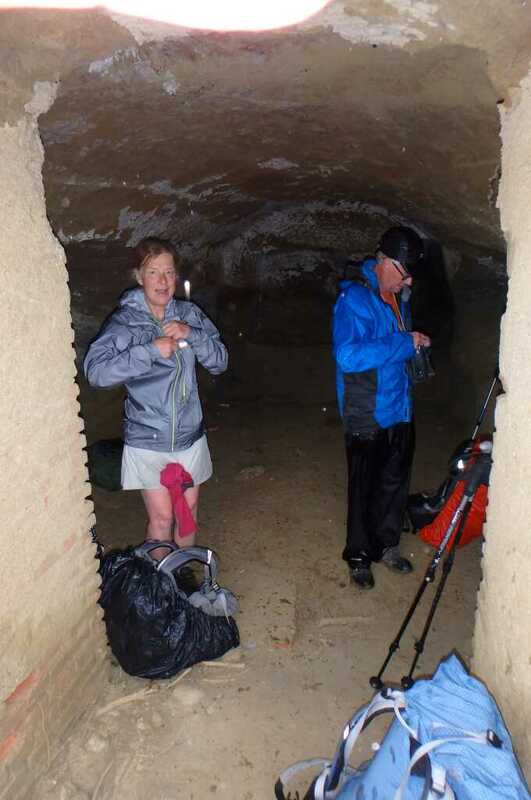 You get used to the Good the Bad and the ugly on camino but all within a couple of hours! Off we go after breakfast at 7.30in the hotel. Up out of town along a long straight tree lined street and down through a bit of an industrial area to the river. We have seen a lot worse exits from cities. 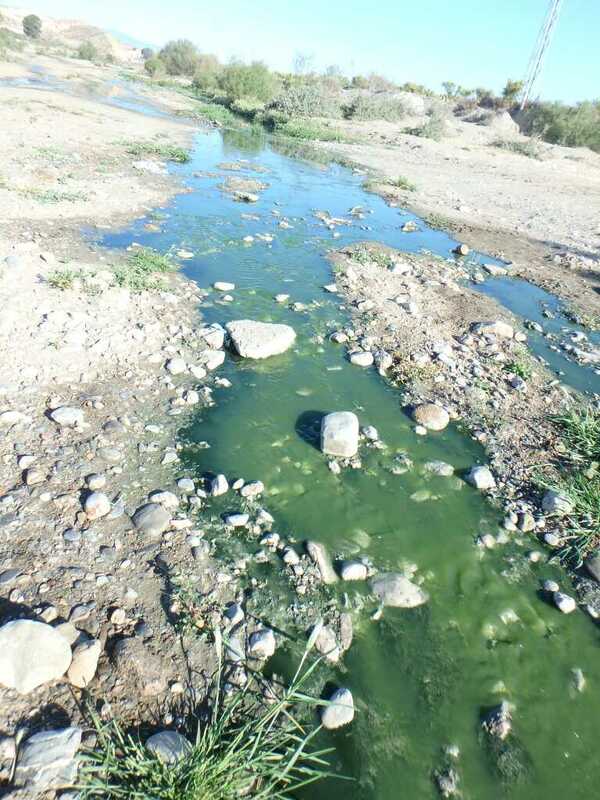 The river however certainly qualified as bad, a iridescent green trickle in a stony Arroyo but the flood plan covered with fields of citrus trees mostly orange in bloom and fruit. The ugly provided by the several acres of tent like structures containing tomatoes and ? courgettes destined for British supermarkets possibly. 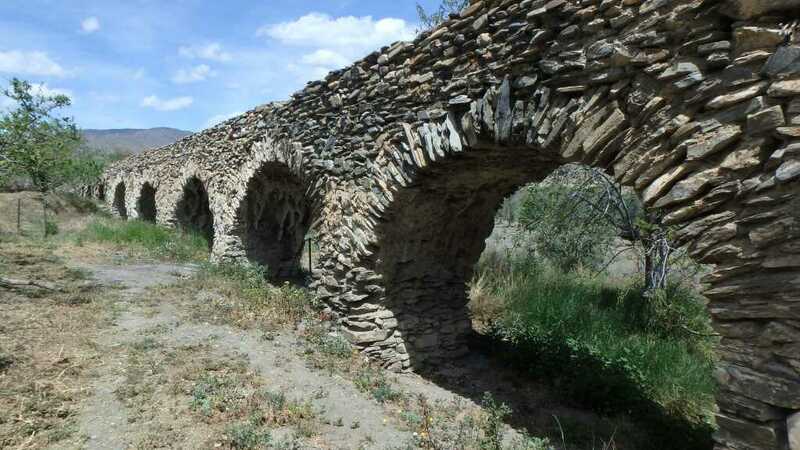 Walking today is either river bed shingle or tarmac and as we approach Santa Fe de Mondujar, our destination we know to lookout for what eventually is a very nice alburgue 1km before the bar that runs it and keeps the key. So all in an extra 4.5km there and back twice. Hey Ho is is the first day. Well a good nights sleep and a late morning by Camino standards all awake just by 8am. A quiet night outside for a Spanish city. Still it is mid week and an economic depression hopefully we shall be well away into quiet hinterland by Saturday night. This is a nice quiet hotel. Task one is to get pilgrim credencials. They can be had from the tourisr office next to the Cathedral the signs are clearly pointing at a demolition site.Eventally we acces the square inside the demolition with tall palm trees and the tourist office. A clue as to the quietness of the Camino Mozarabe is had by the need to print out the forms and find 6 credencials. On the way down we spot a fine mutamoros. For those not familiar with the Way of St James he appears on statuary either as a pilgrim with staff water bottle and floppy hat or as the teacher/apostlle with a book. 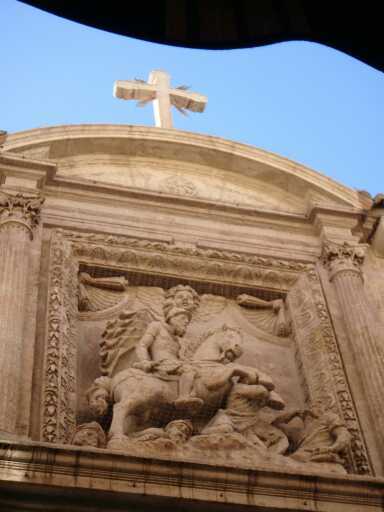 Or as the mounted mutamoros or moor slayer of the crusades. 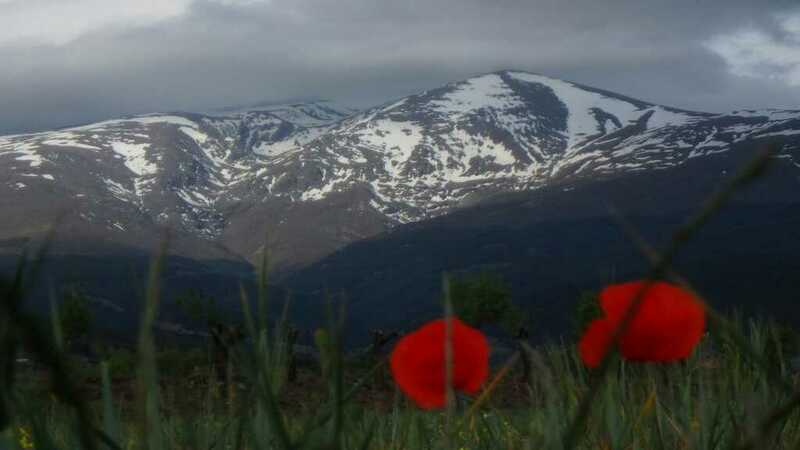 Over the last year we have found them as far apart as Chile and the Philippines, indeed anywhere in colonial spain. 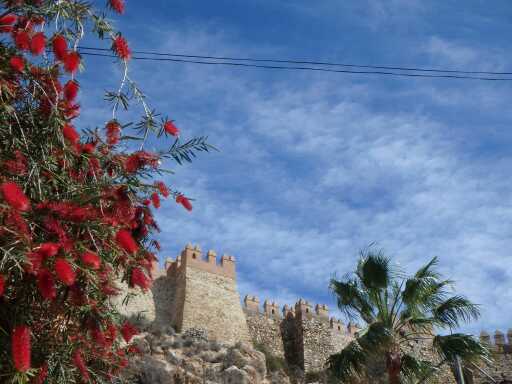 The next aim is the Alcazar the old Moorish citadel and gardens on the hill overlooking the town. This has been very well restored at EU expense but as a consequence entrance is free to EU nationals. A fine use for our taxes we feel. 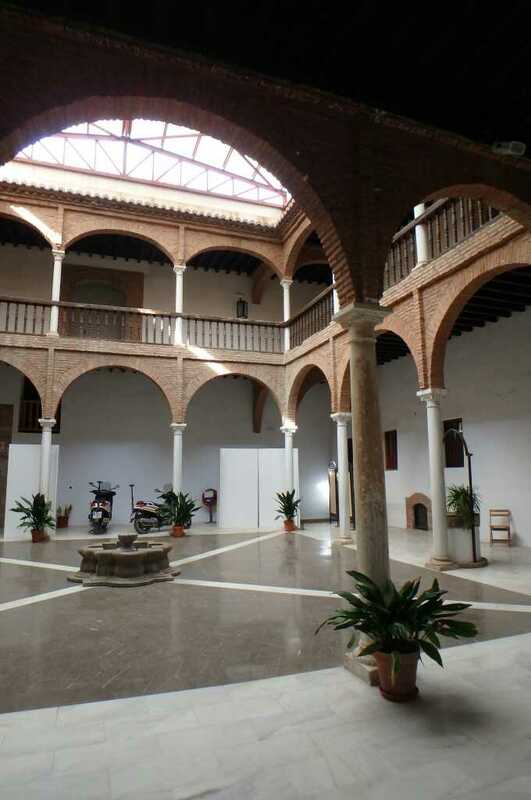 It is very similar to the Alhambra but more restored less original. Old cisterns with goldfish little fountains and waterfalls and many less people than the Alhambra. After this we manage to find the cathedral office and get the credenciales stamped correctly ready for the start tomorrow. It is now lunch times and the usual fun with dishes in local Spainish dialects ensues. We learn that gurullos are little pastas and jibia are small bits of random cephalopod. Entremeses are a starter plate of sausage jamon and a bit of spainish omelette. Later Tony manages to replace his bum bag as the clip had broken when he sat on it.